Welcome to the HGTV HOME Furniture Giveaway hosted by Cheap is the New Classy and sponsored by HGTV HOME Furniture! 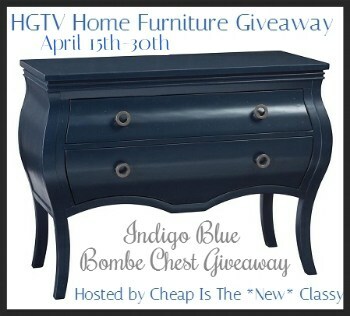 One lucky person is going to win a Bombe Chest from HGTV HOME Furniture in winner’s choice of 1 of 4 colors. The giveaway runs from April 15th to 30th and is open to Continental USA only. I would (probably) pick Top Sail.